Darwin W. and John R. Sunderland, brothers from Rensselaer Falls, New York, were the sons of Albert and Prudence Sunderland. Both served in the Union Army during the Civil War. Darwin, who was born in Addison, Vermont, was a private in Company C of the 106th infantry regiment of the New York State Volunteers. He served in the Union army from August 6, 1862 until he died in combat on May 12, 1864 near Brandy (Spottsylvania), Virginia at the age of 23. John was a private in Company K of the 11th Cavalry unit NYSV, or "Scott's 900". He enlisted in Canton on Dec. 22, 1863 and served until December 16, 1864 when he died of smallpox at St. Louis Hospital in New Orleans, Louisiana. He was 22 at the time of his death. This collection consists of 65 letters (64 originals and one photocopy), transcriptions of letters, 9 envelopes, photocopies of national archives records and research papers on both Darwin and John Sunderland prepared by St. Lawrence University students. 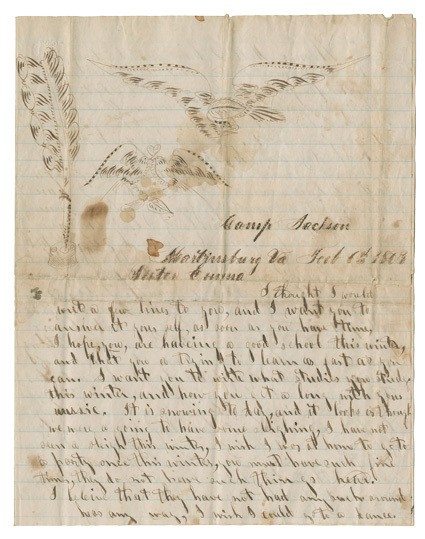 Letters describe camp life, battles, hospitals, and medical care during the Civil War. Series 1: National Archives records; Letters from or about Darwin W. Sunderland, 1861-1864. Series 2: National Archives records; Letters from or about John R. Sunderland, 1864. Series 3: Letters from friends and family members to the Sunderland family 1837-1867. This collection, along with the Graves Family correspondence was purchased at auction on April 8th, 2000 at Stiles Auction House, Rensselaer Falls NY. The Sunderland Family Correspondence Collection, 1837-1867 is housed in St. Lawrence University's Special Collections and Vance University Archives.